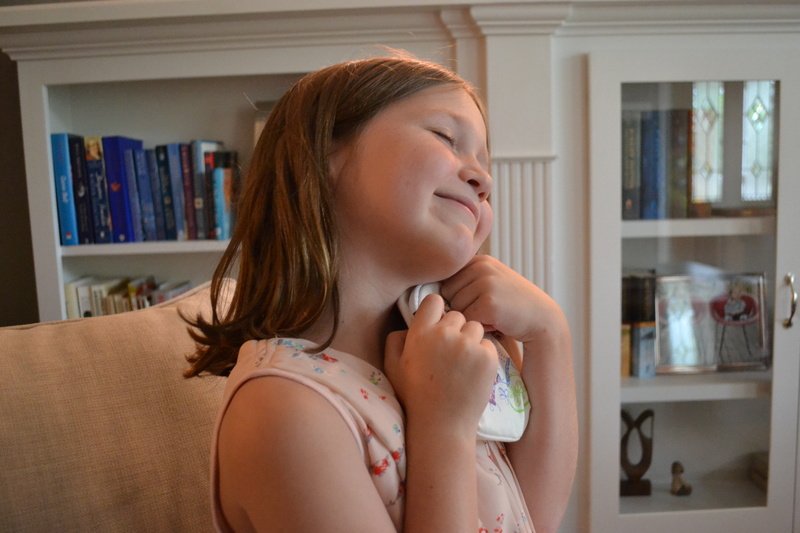 Whining is Closed | Practical Montessori for the Modern Home. Practical Montessori for the Modern Home. It has been a long while since I have posted and I honestly did not know if I would ever begin posting again. My kids are now 7 and 9 years old on the verge of being 8 and 10, I wondered if this was a stage anyone would even care about discussing Montessori and parenting philosophy. I ultimately decided to resurrect the blog in the hopes of reviving my own reflective parenting practice. 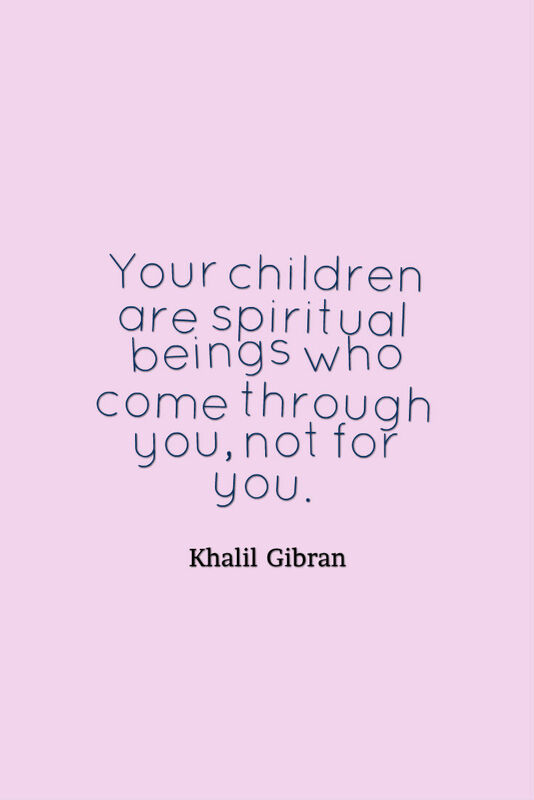 I realize that as my children get older if I am not checking into my parenting and assessing how it is going, we as a family can easily get off track and begin building habits that do not align with our long term goal of raising healthy, productive, interconnected adults. With that I decided a go-to post would be to set my beginning of the school year goals. You can see previous year’s goals here and here. While I haven’t written down new school year goals in several years, I am excited to share our goals for this school year. Building Empathy: We live in Houston and if you have seen the news in last few weeks, you are aware of the catastrophic events that occurred in our city. While we, as a family, were very fortunate to escape any harm to ourselves and our home we know many friends, family members, and classmates were not as lucky. This school year we will focus on empathy for others and building our capacity to support and help our community. I look forward to reading more research on this topic and coming up with a concrete and ongoing plan. Restricting Family Screen Time during the Weekdays: This is always one for us, but becomes even more important as the kids get older. I am the worst offender in my family and I have to do better to show my kids what healthy limits look like. So we will recommit ourselves to no screen time while kids are awake on the weekdays. Building Conversation Skills: During my day job I work with high school students getting them ready for college as a college counselor. One of things I try to do is build “cultural capital” in my students before sending them off into the real world. I want to do the same for my children and help them both, but in particular help my daughter, build conversation skills. It sounds so silly, but the ability to feel comfortable and confident when speaking with peers and adults is a skill I know will take them my kids very far in life. I hope to expand on this goal in a future post. What are your new school year resolutions this year? We gifted my daughter my hand-me-down Kirsten doll this past Christmas. I have enjoyed seeing a purchase my parent’s made over 20 years ago turn into a great investment in inter-generational joy. When my daughter told me she wanted to purchase Kirsten a backpack stating the exact details of the contents and the exact cost of the purchase I knew we were in new territory when it comes to money. My children have always told me various things that would like to have and we have discussed putting said things on birthday or Christmas lists, but this time was different. 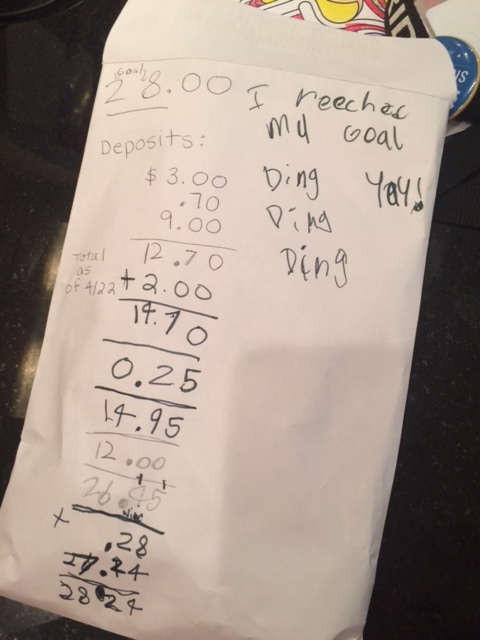 As a child firmly in the second plane of development I knew she understood the concept of saving and delayed gratification, but I wanted to see if she would really follow through with a long term goal. Would she change her mind or waiver on the end product? We set out to test this new drive and push us as a family to think about children earning money in a new way. I have discussed in the past that my children to do not get paid for chores household expectations. I hold firm to that idea so it was a bit of struggle to think of how she would go about earning money. We decided that she would need to go above and beyond normal expectations to work towards her goal. We started our money saving journey by finding out how much she already had saved and how much was left to go before reaching her goal. This was a great practical life math lesson and increased her urgency and excitement around her goal. We used an envelope to track her progress towards her goal. It was a great visual and a dedicated place to keep the money safe. Things she did to earn money included earning $1 for emptying all of the dishes from the dishwasher for the family and $3 for doing all of the “kid clothes” laundry including putting it in the washer, transferring it to the dryer, folding all of the clothes, and putting them away. 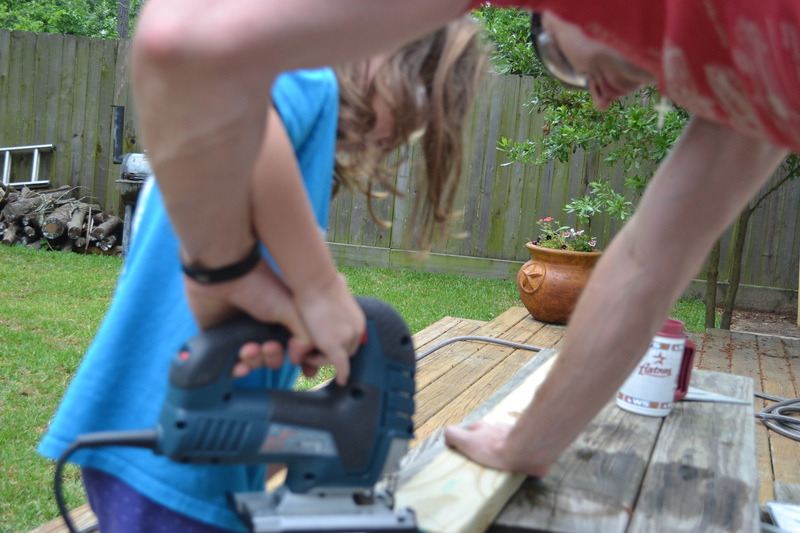 The biggest pay day she received was helping her dad build a railing on our deck. This took several days and required her to commit to the project in order to be paid. After two weekends she earned $10 and lots of pride for a job well done. All in all it took her about a month to earn and save enough to meet her goal. We celebrated with a Mommy-daughter date to make the purchase. She was beaming as she handed the cashier her hard earned savings. I look forward to this becoming routine for our family. Practical Life for the older child can be challenging. The novelty of the two-year old scrambling eggs or the four-year old doing laundry can be engaging for both parent and child. When thinking about my 7 year old doing these same tasks it falls more into expectation rather than a growth activity. In order to keep our kids maturing and progressing in Practical Life we must observe their capabilities and be willing to include then in all aspects of family life. My husband is very handy; being very handy has led him to have a long list of to-dos and house projects. Including the kids, ages 5 and 7, in these activities requires more time and more patience but I am proud that they are learning these skills at a young age. My son, age 5, took on an age appropriate task of his own. 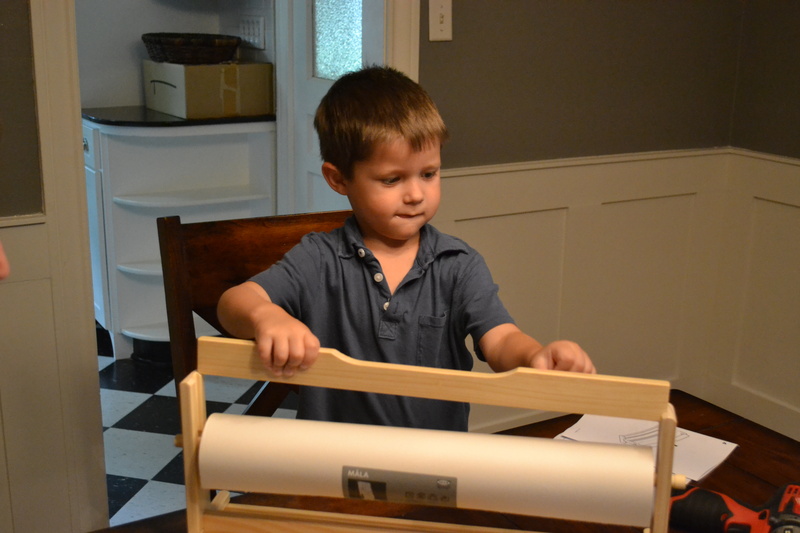 I purchased the MALA tabletop paper holder for the kids to use for art projects. Ikea products are great for building beginners as the instructions are very similar to that of Legos. My son felt confident laying out the pieces and following the instructions with little adult intervention. 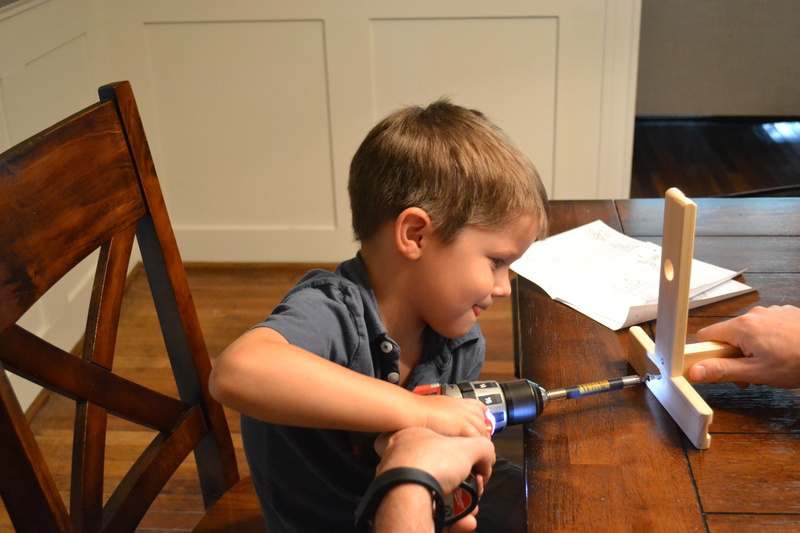 The small wrench that came with the product (and all Ikea stuff) proved challenging for his little hands so my husband helped him tackle the screws using a drill, again with proper guidance and supervision. This beginner projects and skills will likely grow larger in scale as they grow larger in scale challenging both parents and kids to develop more skills and more patience. During a recent check-in with a colleague (hey, Rhiannon! ), she brought up a way of approaching a new task that totally shifted my perspective. All you have to do is start by asking yourself if you need more knowledge, more skill, or a change of mindset. This resonated with me so deeply that I knew I couldn’t keep it just in my professional sphere and needed desperately to move this little mental test to my parenting as well. Now when I am thinking about my parenting and looking at an issue or something I want to work on or implement I ask my self what I am lacking! So simple, yet so effective. Knowledge is the easiest to acquire when it comes to parenting. We live in an age where information is everywhere. A simple search can find us all the information we can handle and usually much more. Of course, the knowledge acquisition part comes after sifting through all of the information to find the applicable knowledge. I find it helpful to only read articles that fit with my parenting philosophy and not worry about all the rest. Parenting books are also a great way to gain knowledge. I remember how “How to Raise an Amazing Child the Montessori Way” by Tim Selden brought so much knowledge into my world when I was just beginning to discover Montessori. I also love “Simplicity Parenting” and “How to Talk so Kids will Listen & to Listen so Kids will Talk” for increasing my knowledge base and helping me shape my parenting philosophy. I also rely on my networks of fellow parents to provide me with knowledge from their own experiences. If knowledge is the “what” then skill is the “how”. I am often the most aware of a skill deficiency in my parenting. I know I am not alone as one search of a parenting forum shows that many requests are asking for the “how”. An example might be, how do I get my kids to bed at a decent hour? The knowledge of the importance of sleep is there, but the skill (the implementation of the “how”)is lacking. We gain skill in parenting by trial and error, practice, and the modeling from other parents. The parents of a newborn may fumble with the first few diaper changes, but in a matter of weeks they will be able to change a diaper at 2am in the dark while half asleep. I love to observe other parents. I often take away some phrasing or trick when I observe a parenting moment thus gaining a bit more skill. Build independence within defined boundaries while creating a joyful childhood. When I approach my kids with a mindset that they can’t do something that they have never been given the chance to try or when I get lazy and boundaries go out the window, a reset of mindset is in order. Having the grounding statement above allows for me to know when my mindset is off. I am so excited to implement this strategy until it becomes habit. I have the knowledge and mindset to make it happen, now I just need to practice to master the skill! Where do you go when you want to increase your parenting knowledge? What skills have your picked up from other parents? Have you had a mindset shift lately? Please share your best resources in the comments or on the Whining is Closed Facebook page. I recently gave a presentation on Montessori & Discipline for fellow parents at my children’s public Montessori school. I know many people were unable to come to the actual sessions so I wanted to provide the materials for home use. My main goal for this session was to make it very personal, to think about each parent’s individual child(ren) in order for it to be effective. I have also included the worksheet which helps break down into steps how you might approach a behavior/discipline problem from a more Montessori-inspired way. Please comment if you have questions or want to engage in a discussion on this topic. My son, age 5, has recently become very excited about math. He is working on golden bead addition at school and is eager to explore all things math related. Listening to Maria and “following the child”, what should we do to encourage this love of math? We could go out and buy math “works” to extend his learning at home, but I am very strongly against doing work outside of school and the work period. We could get flash cards to drill and kill math facts, but that seems to me to be the quickest way to drill and kill a love of math. Instead we decided to focus on math that we encounter in our daily lives, the truly practical life math. Measuring anything and everything. The kids use a tape measure to help their dad figure out how much molding we need for a house project. They use measuring cups to find 1/4 cup of sugar for pancakes. Measurement is a great active type of math that combines both the tactile experience with brain power needed to make sense of the numbers. Adding the tip and total at a restaurant. This is by far my favorite thing we started doing. I love to see my son, pen in hand puzzling over the amounts. We work with the kids to figure out how much to tip (doubling the first number of the total) and then how much the total is once the tip is added. 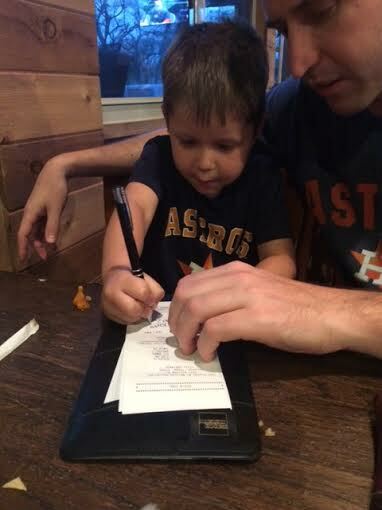 Adding up the tab at our favorite Tex Mex place. Monitoring sports scores. I am a huge college basketball fan, so March has left many games on in our house. We challenged the kids to figure out who is winning and by how much. It is so fun to watch my 7 year old approach this challenge differently than the 5 year old. It is also fun because in basketball the score changes quickly and they have to think fast to keep up! Telling time. This one is tough because time is still very abstract to both of them. We usually just ask probing questions to get them to think about time. For example: “What time is it? If we need to go to ballet at 4:30, how long do you have to play?” Neither of them get the answer right very often but that leads to a great teachable moment about 60 minutes in an hour and so forth. I love watching my kids use math in their everyday lives. I hope they continue to love math and see the connection between being independent and using math! 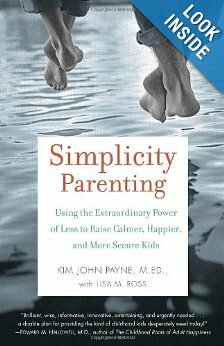 Every six months or so, I pick up and reread (or re-skim) Kim John Payne’s “Simplicity Parenting”. It has easily become my favorite book on parenting and one of the pillars of my parenting philosophy. It resonates with me for two main reasons: it is aspirational and it is practical. It challenges me to be a better parent and actually provides ways to implement the philosophy in practical ways. When I first picked up the book in the summer of 2013 it prompted me to set some really great goals for our upcoming school year that proved that small changes can make a big impact in our daily life. I usually pick the book back up when we, as a family, are ‘off’. Usually after the whirlwind of the holidays or if my husband has been traveling a lot for work. It is a home-base for me, to recenter my parenting and realign my actions with what we value as a family. I also really enjoy discovering new points in the book that I may not have gravitated to in prior readings. This is the forever-needed reminder that parenting is real hard, y’all. It is not static. It is absolutely true that once you get something down or feel confident in one area of parenting, something will change and you may have to go back to square one. This passage reminds me that I am not alone in that feeling and it is a totally normal part of parenting. In the chapter entitled “Environment”, Payne discusses the negative effects of advertising on our children. The conclusion, not only re-inspired me to continue to keep my kids away from marketing and advertisements directed at them as much as possible (thanks PBS and Netflix for making that easier), but also pushed me, uncomfortably, to think about my own relationship with entitlement and how advertisements or even social media can play with my sense of worth. This passage validates my concerns about pushing too soon and reminds me to chill out. If he is to become the next soccer or baseball star he will do so regardless of playing in an organized way in PreK. I also like that he has joy for these sports and do not want to taint that joy so early with a negative experience in organized sports. I really do love coming back and rediscovering a point or unearthing something new to fit our new stage of life. I take notes in the book’s margins in a different color every time I pick it up. This colorful timeline is a visual reminder of how valuable this book has been to my parenting journey and I look forward to revisiting simplicity in the years to come. Montessori Meal Time: A NEW Adventure!